An elephant never forgets, and neither will we. A sweet alternative to a memory bear. 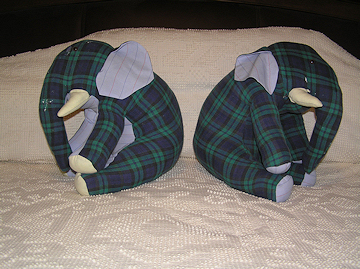 Well-loved pajamas became an even more loved keepsake elephant. 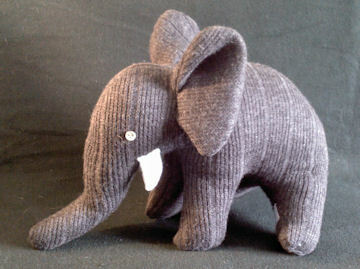 14" tall, 34" trunk-to-tail! Can be made in a smaller size. 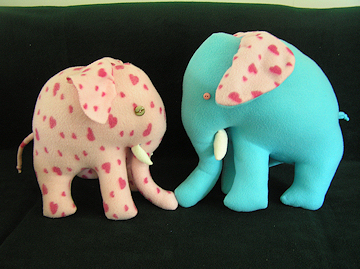 A memory-filled birthday gift Elephant for 2 two-year-olds - so special! she would love you too! I'm here for you to hold! 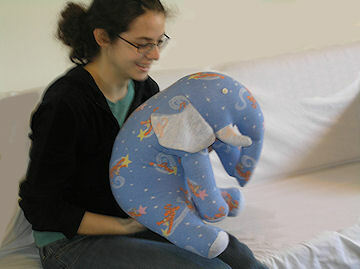 We started with 2 soft baby blankets and created 2 soft, huggable standing elephants. 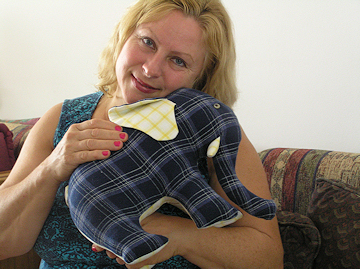 This elephant, made of great-grandparents' shirt and shorts, was the best gift at the baby shower! We will always love you so! Keepsakes with button eyes should not be used as toys for very young children. We can use Safety or Embroidered eyes when these Bears are created for young children. Please let us know.